Commercial toothpaste most commonly contains many ingredients that are potentially harmful to our health and this is particularly concerning for individuals who have impaired detoxification systems. Some of the most sinister ingredients to watch out for include sodium fluoride, triclosan, sodium lauryl sulphate and propylene glycol. It is also worth mentioning other ingredients like artificial colours and dies that are not appropriate for people following the GAPS diet. Sodium fluoride is a dangerous by-product of aluminium manufacturing and excessive intake of fluoride is known to cause a condition called dental fluorosis. A clear sign of Dental Fluorosis toxicity is shown with mottling of the enamel appearing as white spots on the tooth but the damage is much deeper affecting many organs and bones in the body due to the fluorides known anti-thyroid characteristics that contribute to long term illness and debilitating health conditions. Dental Fluorosis occurs during child development with the first stages of tooth enamel formation leaving a clear sign that the child was exposed to an overdose of fluoride during the development stage. The United States Environmental Protection Agency classifies triclosan, commonly found in toothpaste as a hazardous pesticide posing a threat to both human and environmental health. Sodium lauryl sulphate is a detergent and emulsifier used in hundreds of cosmetic products. The environmental working group (EWG) have compiled nearly 16,000 studies in the PubMed science library about the toxicity of this chemical and its links to organ toxicity, irritation to skin and eyes, developmental reproductive toxicity, neurotoxicity, endocrine disruption, ecotoxicology, and biomedical or cellular changes including cancer. Propylene glycol safety data sheets show warnings that the chemical can be rapidly absorbed through the skin, with prolonged contact leading to brain, liver and kidney abnormalities. Olive Oil: Dr Natasha brushes her teeth with olive oil. Some people also claim that this can aid in maintaining pearly white teeth. The most common motivation to use olive oil is it’s ability to help maintain healthy tooth enamel whilst pulling toxins from your mouth and gums. An Oil pull will also aid further in pulling toxins and should be practiced regularly for good oral hygiene. Pure Bicarbonate of Soda: Brushing your teeth with Pure Bicarbonate of soda not only cleans your teeth very well but it alkalises your mouth and tongue and leaves your mouth extremely clean with a lovely pink tongue and gums. Keep a container and teaspoon with a small shot glass in the bathroom and take half a teaspoon of the bicarb and place it in the shot glass, then wet your brush and dab it into the bicarb contained in the shot glass. This way, you avoid contaminating your bicarb with bacteria build up in the container because continued dabbing of a wet brush can leave clumps. If you want your mouth feeling more fresh, add some peppermint oil. You can also combine olive oil and bicarb to brush your teeth by wetting your brush with olive oil then dabbing it in the bicarb. If you choose this option, you may need to shot glasses. Activated charcoal: Carbon is a magnificent source for removing acidic plaque and stains from your teeth and many people who have tried it praise the magnificent results from the brightening and whitening action power that activated charcoal achieves. 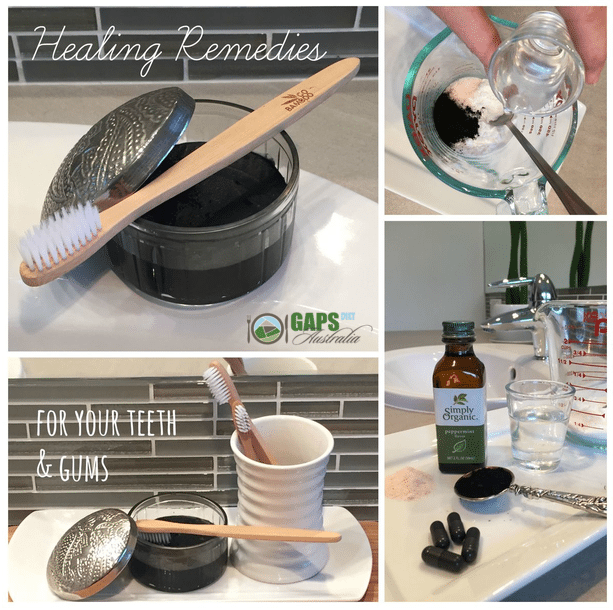 You can add this ingredient to any of the tooth brushing remedies above or you choose to make your own toothpaste from the following recipe. In a small glass jar, add all dry ingredients and mix with a spoon. Pour in the olive oil or coconut oil (make sure the coconut oil is liquefied) and mix the ingredients into a paste. Add 7 drops of peppermint Oil flavour and mix entire ingredients together. You may need more or less oil depending on the desired thickness of the paste. Maybe you might like to use a non toxic bamboo toothbrush. This recipe keeps better and fresher when small batches are made. Aim to apply the amount of paste you wish to use each day in a small shot glass and dip your brush into the paste to clean your teeth. If you continue to dab your brush into the mixture you have made, you may create clumps and this is best avoided. Be mindful that the charcoal will stimulate a black paste covering your teeth during brushing but your mouth will be left sparkling clean after you have rinsed with filtered water. Be mindful to keep your mouth closed when brushing to avoid spraying charcoal on your clothing as it can get a bit messy. After some time your teeth will become whiter and your gums and teeth will love you for it.